Convolvulos Prime White has a handsome, mounded, upright habit with mid green foliage. This is a new release variety which is well branched and compact with plenty of blooms. It makes a great bedding plant, good ground cover, is superb in containers, wonderful in rock gardens and excellent as an edging plant. 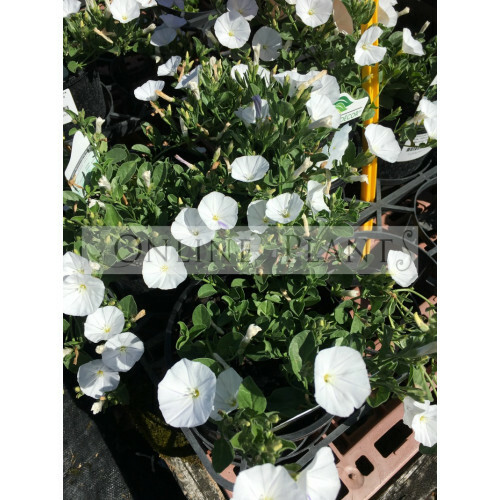 Convolvulus is super hardy and low maintenance. The plants are covered in flowers for many months and they are dry tolerant. Each bloom is around 3 cm across. Plant Convolvulus in moderately fertile to humus rich, well-drained soil. Grow in a sunny spot. Suitable for gardens and pots or hanging baskets. A great choice for combination planting with spring bulbs as they will grow right up through the carpeting foliage. It is also a nice option for planting beneath roses as it will not compete for nutrients and will help to shade the ground. 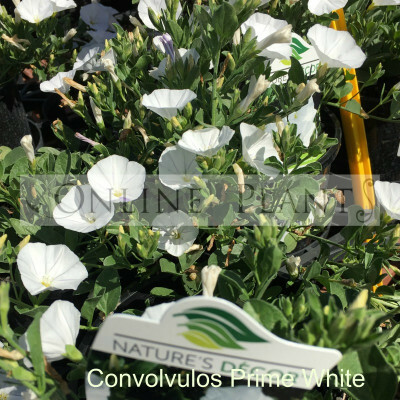 Buy Convolvulos Prime White Plants from Online Plants Melbourne. Australia's largest online retail Nursery. Over 3000 species of plants.